Do you have or know a child who is learning to read in English? If so, do you know about the online program Sight Words? It is a free educational resource for teaching children to read and the site has just introduced a great new curriculum, sponsored by the Georgia Preschool Association, for teaching Phonemic Awareness (also called Pre-Phonics) to children. 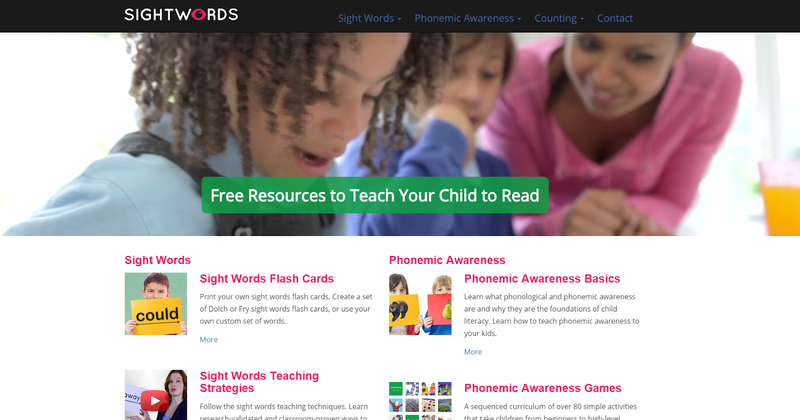 Their site is packed with games, activities, and tools to help parents and educators prepare children for learning to read. Sight Words Lesson – Use our teaching techniques to introduce new words and to review words from previous lessons (10 minutes). Sight Words Games – Use our games to provide reinforcement of the lesson and some review of already mastered sight words to help your child develop speed and fluency (20 minutes). Parents! Take advantage of these free resources whenever you can. They are there to help you!